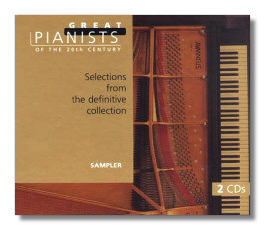 In a millennial spirit of cooperation, Philips Classics has joined together with more than two dozen other recording companies, plus Steinway & Sons, to present a 200-CD collection of… well, the great pianists of the 20th Century. The series is scheduled to be released in ten 2-CD sets each month over the next year. (December 1998 and July 1999 will be vacation months.) With two exceptions, each set will be devoted to a single pianist. Many pianists will be represented by two of these sets; some (Arrau, Gilels, Kempff, Richter, Brendel, Horowitz, and Rubinstein) will be represented by three. In all, 72 pianists will be included in this project, which is unprecedented in the history of recordings. Philips has released an enticing 2-CD sampler. It previews the work of most of these pianists (Gould and Serkin were left out, apparently for contractual reasons). Let's see: 152 minutes divided by 70 pianists… that gives us about two minutes for each of the performers. As a result, the sampler consists mostly of encores, other short pieces, and, less satisfactorily, excerpts. The discs are bound into a hardcover book (just like Sony's Masterworks Heritage series), and there is a paragraph about each of the performers, from Géza Anda to Kristian Zimerman. Pretty handsome! It's a great opportunity to play "Name That Tune." No recording dates are given, but the range is from the era of 78-rpm records to that of modern digital sound. Is this typical of the actual releases? Philips sent me a release sheet on the first ten. I hope to review at least some of these in greater detail, but I can give you an overview here. First up on the reviewing stand are Martha Argerich, Claudio Arrau, Wilhelm Backhaus, Alfred Brendel, Julius Katchen, Emil Gilels, Clara Haskil, Vladimir Horowitz, Wilhelm Kempff, and Stephen Kovacevich. The Argerich, Arrau, Backhaus, Gilels, and Haskil discs present them in one or more concertos. The solo pieces are, for the most part, substantial. For example, the Kovacevich discs consist solely of Beethoven sonatas, and the Backhaus set preserves the pianist's 1954 Carnegie Hall recital in its entirety. Overall, some of this material is new to CD; some of it hasn't even seen commercial release before. Like everybody else reviewing this project, I imagine, I feel compelled to comment on who has been left out. Where is Tatiana Nikolayeva and her wondrous Bach? Grigory Sokolov? Evgeny Mogilevsky? ("Aha," the astute reader thinks, "I see a pattern.") Well, it doesn't really matter, because this is a great project because of its sheer daring, and it should give pianophiles plenty to listen to and talk about over the next year.